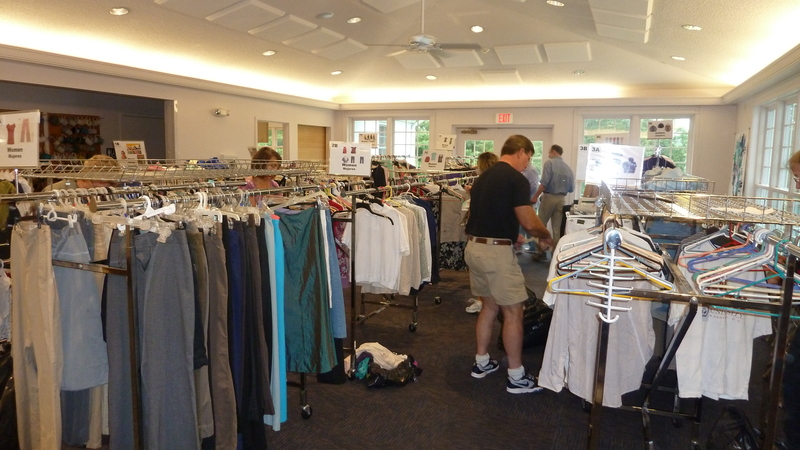 For over 15 years I’ve helped maintain the Clothes Closet ministry at our church that followers of this blog or my newspaper column have heard me mention in stories from time to time, such as here and here. 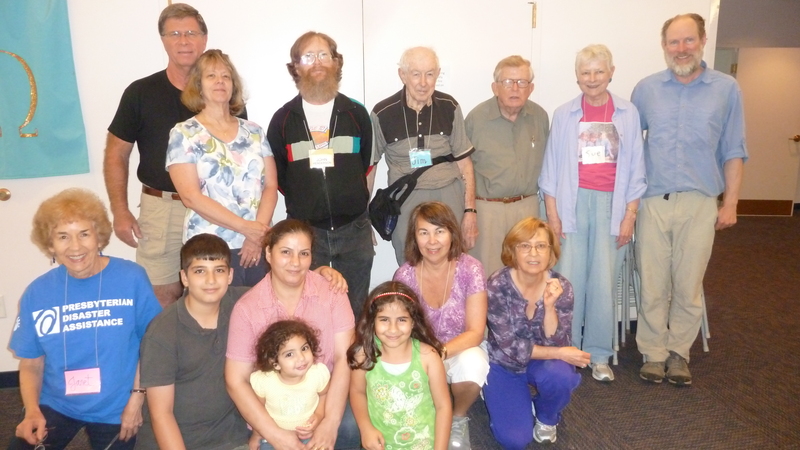 –Helping “train” a new volunteer and member of our larger congregation—what a great way to get better acquainted. 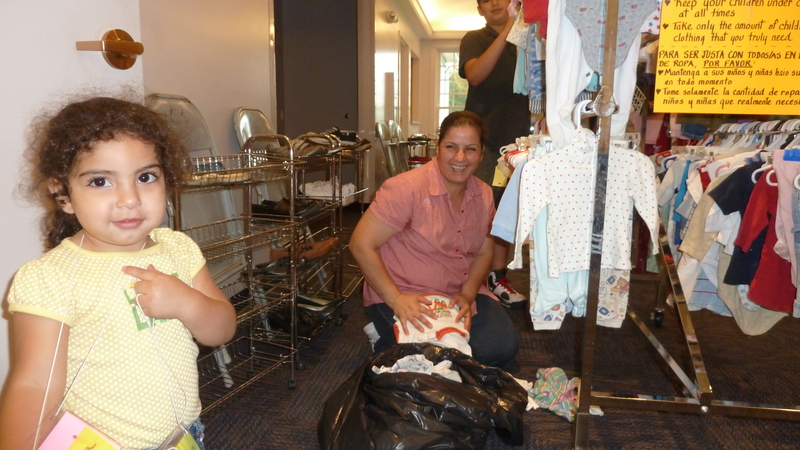 –A beautiful mother and children whose family immigrated from Iraq have helped us for several years in this biannual activity, and we have enjoyed learning to know her and her family, and appreciating Basima’s growing language skills. –Over the morning, Lana, (left) who was at first either sleepy or worried about leaving her mommy out of her sight, gradually warmed up and began casting shy smiles my way. –It is a time to catch up with each other about summer highlights, grandchildren, new jobs for children, illnesses and other trials. –It is one way we help our community recycle clothing and save it from the landfill. There are suitable jobs for all. 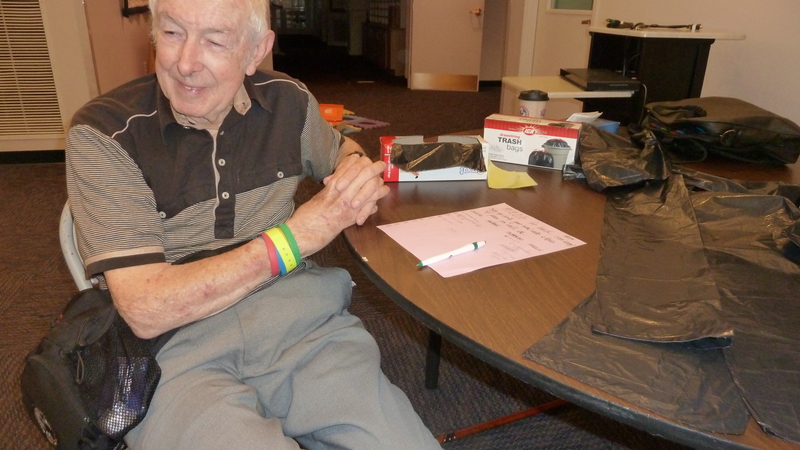 Our oldest helper, Jim, helps by making tags for the clothing that we remove from racks and take to Mercy House’s Used Clothing Store. Children have frequently helped through the years. 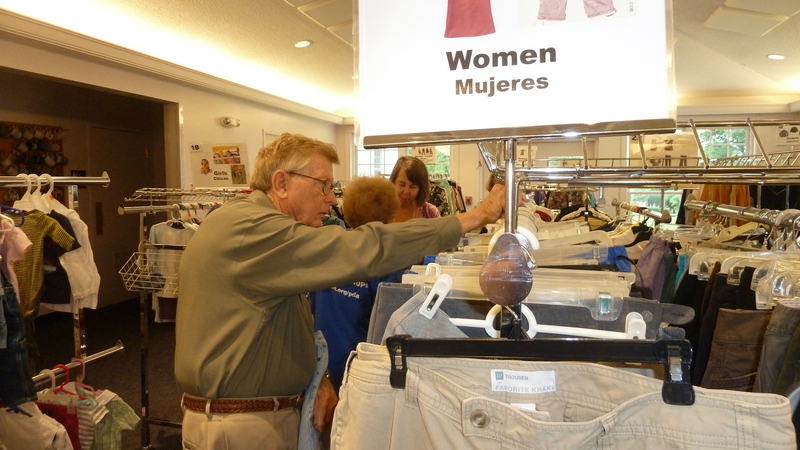 Here is a shot of my daughter Tanya, middle, and Kevin, far left, helping out William Ramkey at the Closet, a retired Presbyterian minister. The Closet has been in several locations around town, and at that point was housed at Community Mennonite Church. Basima’s son, Mustafa, is old enough now to be a great help moving and lifting boxes in the storage. 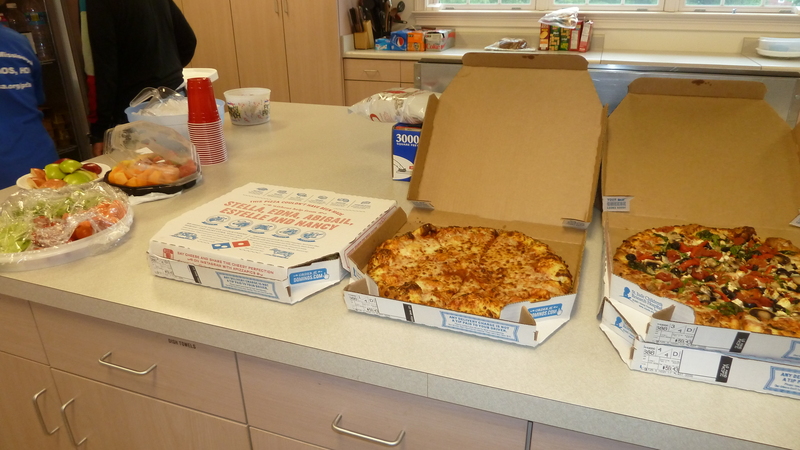 And what crew of workers is not spurred on by the promise of a pizza lunch! 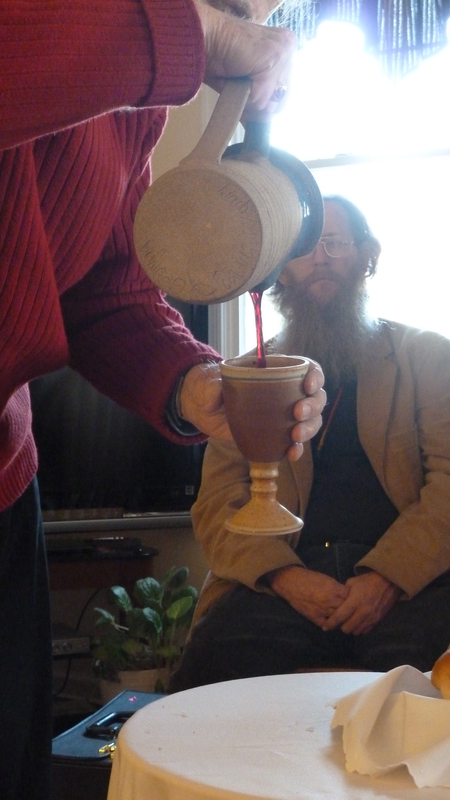 grape juice at a house church worship service. Front row: Janet, our awesome mission coordinator; Mustafa; mother Basima with daughters Lana and Danella; Patti, Karla. Back row: Fred, Cheryl, John, Jim, Bill, Sue and her son home for a visit, Mark. Also missing from this photo, Elaine and her adult granddaughter. What do you enjoy about volunteering or giving of your time in the community? 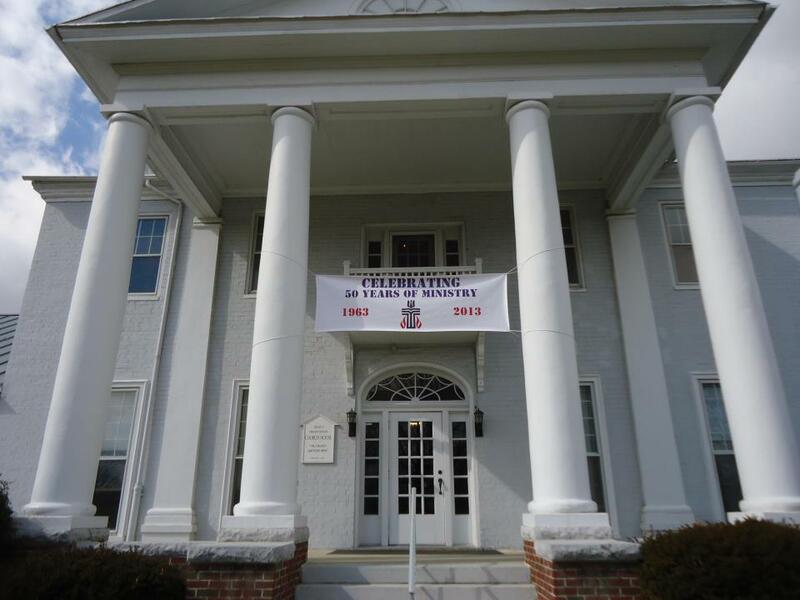 Here’s the front of our church building, Trinity Presbyterian, a historic pre-civil war home. To get to the Clothes Closet, you drive around to the back parking lot. Anyone is welcome, regardless of income: college students, friends, family. 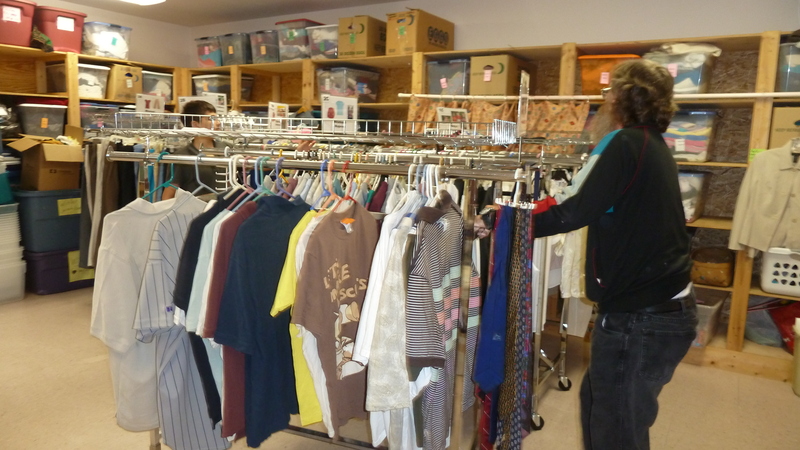 We are able to accept donations of clothing only on Wednesday mornings from 9-11 a.m. The Closet is open for clients Wednesday evenings 6:30-7:30 p.m., and the first Saturday of each month from 10-11 a.m. Two other churches help us staff the Clothes Closet for which we are very grateful: Muhlehburg Lutheran and Harrisonburg Baptist Youth Group. Such a worthy cause and certainly appropriate for a blog post today with winter approaching. One of the photographs of Mother I treasure most is her standing behind the counter at MCC Gift and Thrift near Mt. Joy, PA where she helped process piles of clothing. She also enjoyed the camaraderie you reveal in your photos. Yes, I volunteer at church teaching 2-year-olds and serve as president of our neighborhood association. In addition to contributing to the common good, I have enjoyed the friendships and volunteering is a sure-cure for the blues! Oh, and I voluntarily make my husband one hot-cooked meal every day. Does that count – ha! Yes, the camaraderie is the thing! Thanks for finding another great word for it. I can imagine you do treasure that photo of your mother. Whenever I have joined an organization in the past, I have noticed how it is only as I truly get involved on committees, work parties, etc., that I get past the hello how are you formalities. Hot meal served at home–what better deal is that! Just had to add this: My volunteer friend (also a Southern friend Carolyn) sent me recently a quote that’s a propos this post: Volunteers are not paid because they are worthless. They are not paid because they are priceless. Love it!!! I will share that with our volunteer coordinator, who was also a professional in that field for a number of years at a retirement home. Thanks, Marian & Carolyn! One is called Chances Are and it is run by volunteers at the small Hospital called the Uxbridge Cottage Hospital in our town of Uxbridge Ontario Canada. It started around 1986 and through the years, the money raise there, has gone to the hospital and if you can believe it, they have donated over one million dollars to it. Prices are reasonable and for years I kept some of my grand kids in clothing. The other one is located in Stouffville ON and is called Care and Share. 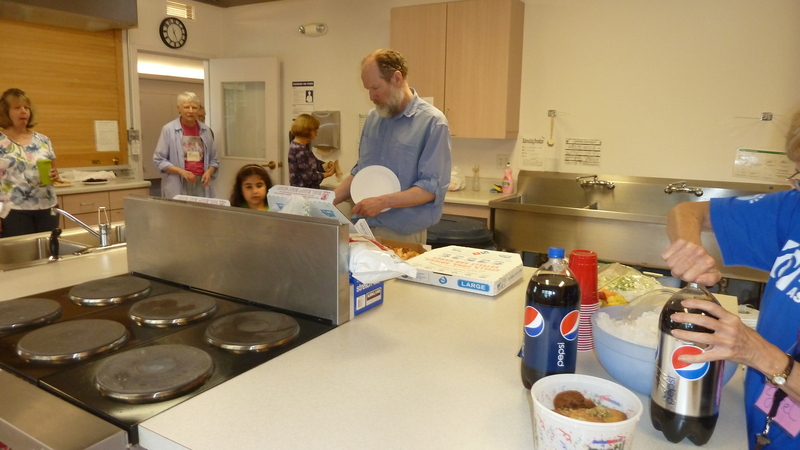 It is run by the Mennonite Central Committee and all the proceeds there go to their ministries . in and work on quilts once a week . This too was a place where I spent a lot of time when the kids were growing up and I enjoyed helping out our family and the work of the store as well. These shops have the ability to raise a lot of funds for these ministries and that is wonderful. 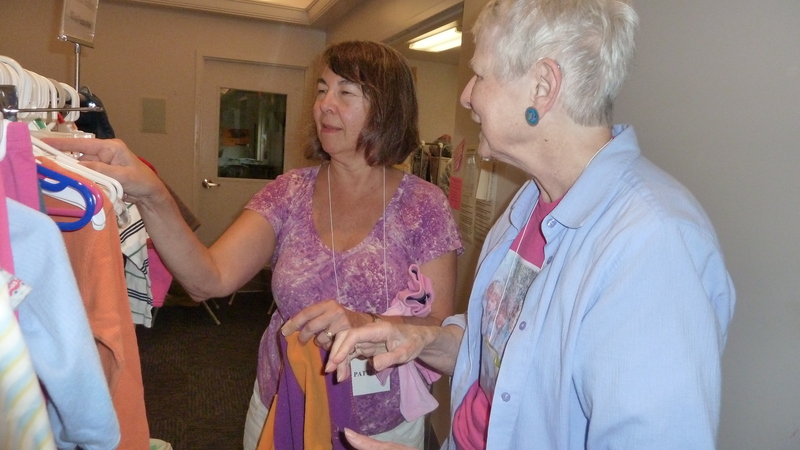 I just recently read that Mercy House, a program helping homeless families here, gets about half of its budget from the money raised through sales at the clothing store for Mercy House. I go there too, to donate and to buy. But I also appreciate that through the church, we can do this ministry for free, and the space at the church is allocated for the clothing closet (we move clothes racks into and out of our fellowship hall every time we’re open). So there is something nicely theological about offering the clothing for free–in the church. Thanks for sharing your many wonderful experiences. The fellowship while working is really great. 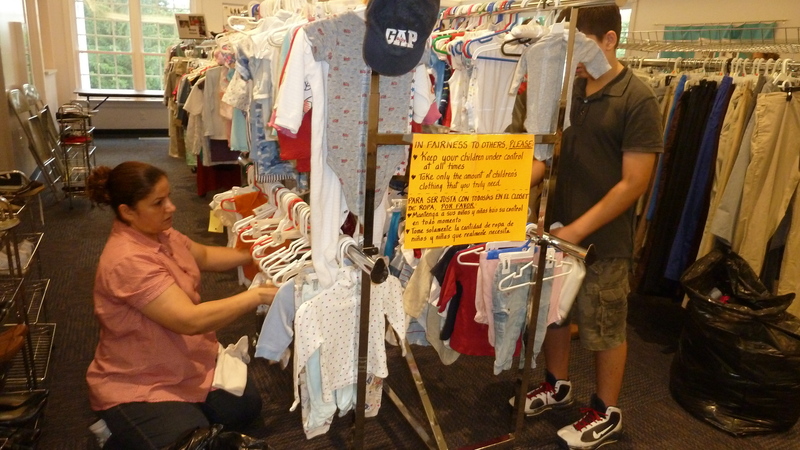 Thanks for highlighting the Clothes Closet’s ministry! I love the pictures! Trinity PC is deeply embedded in my heart! When I think of “Faith Community”, I think of Trinity! Donna, did you work with the Clothes Closet? I love your line here at the end about faith community. What a tribute. Bless you!